Hapag Lloyd is located in Hamburg in the north of Germany. It is one of the biggest container shipping lines in the world with more than 100 vessels operated. The Tokyo Express is a modern container vessel of almost 300 meter length and a capacity of 4890 TEU (Twenty food Equvalent Unit). This is were we did this case study. A current topic in the maritime industry is green shipping. A lot of effort is made to upgrade vessels with new technology to minimize its negative impact on the environment. 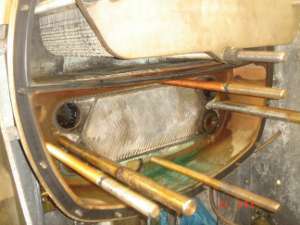 Using chemicals to clean or operate engines and machines is viewed critically. Hapag Lloyd, just as many other shipping companies, is looking for new measures to make shipping more environmentally friendly. On all vessels traveling the sea not only along the coastline, drinking water or fresh water has to be produced on the ship from the seawater. In this case an Alfa Laval fresh water generator is on board, with a production capacity is 25m3 a day. Despite cleaning the generator with chemicals the production capacity declined over time. Once the produced volume had reached the minimum amount of water needed on the vessel the fresh water generator had to be disassembled. Every plate needed to be cleaned manually with chemical cleaning agents before putting it back to work. Besides all seals needed to be exchanged during the cleaning process. The cleaning process not only produces costs it also means that while the cleaning work is done no fresh water is produced on the vessel. 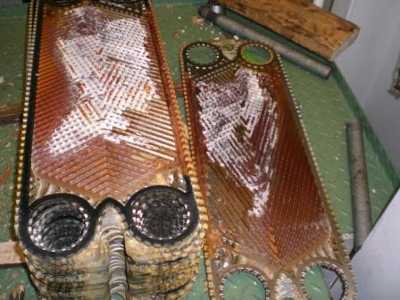 The first picture shows what the plates in the generator look like after some months of operation. Ring on the common feed line, to treat all the feed water to the machine. Thus both sides of the fresh water generator could be treated by only one Merus Ring. 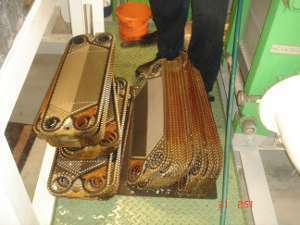 Both sides means, the condenser side and the evaporator side of the plates in the heat exchanger. 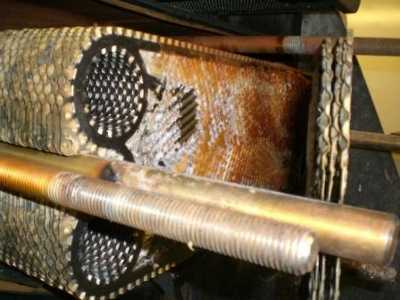 In order to get a clear picture about the performance of the Merus Ring it was also decided by the customer, not to clean the heat exchanger plates, after taking the picture. The fresh water generator was assembled without removing the existing deposits. At the same time they stopped adding chemicals for water treatment to the system. Furthermore they decided to keep the fresh water generator running over 8 months without opening. The reason was, that after this period of time the vessel needed to go to the dry dock anyhow. ts data about production volume and pressure in the generator. Therefore it is quite easy to monitor the development on the inside. Under normal conditions, a gradual pressure drop is expected as described above. After installing the Merus Ring we recorded an astonishing increase of the production volume. After increasing the value stabilized on the nominal capacity until now. „Seeing is believing“ that’s why the fresh water generator was disassembled in the dry dock in Hongkong as planned before. The purpose was solely to see the development on the inside. The picture shows that all plates are clean, just as assumed from the monitoring data. The only dirt visible is a brown film which could be removed easily with a cloth. There are three benefits for the customer of installing a Merus Ring. Firstly it’s a huge time and money saver in terms of cleaning costs. Secondly no chemicals are needed which is one big step towards green shipping. The third benefit is that chemicals and cleaning utensils take up space on the vessel which is a rare good. If you are interested in more information concerning Merus Rings on a vessel please don’t hesitate to contact us.